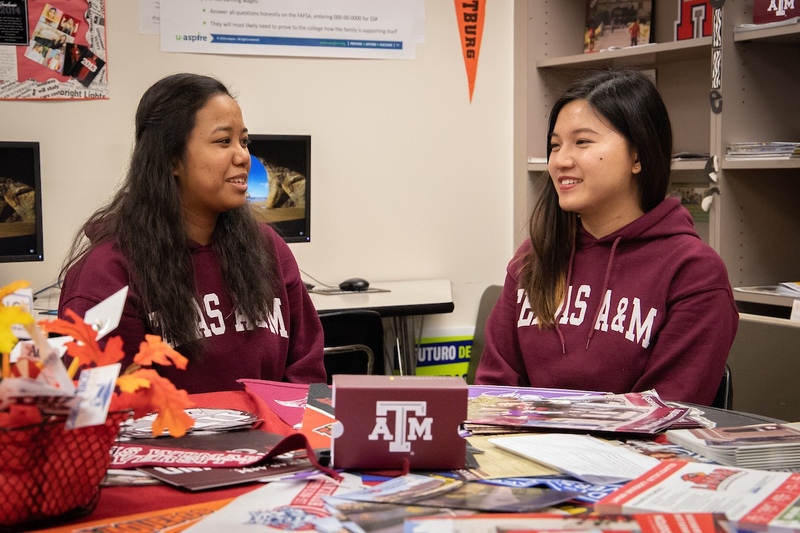 In a Westfield High School room packed full of computers, scholarship information and university materials, Holly Rabano and Rachel Ng sit at a corner table and page through their future. Rabano, a senior from Carl Wunsche Sr. High School, and Ng, who will graduate from Westfield, will be attending Texas A&M University this fall. Rabano said that her father's experiences in civil engineering and architecture fueled her interest in a civil engineering major. While her scholarship will get her enrolled, she expects her posse to help keep her on track at Texas A&M. "They select 10 students who best fit that school, and those students are supposed to stay together for four years. It's kind of like a support group and that's why they call it a posse," said Rabano. Ng said the months-long process is tough. "I just went in there, I tried to be myself and showcase what I can do," she said. Ng is planning to major in nutrition, a subject that she became interested in when she moved here from Hong Kong in the ninth-grade and noticed the vast amounts of unhealthy foods that were widely available. "I originally got into this field because I have a passion for healthcare. I love caring for other people," she said. Rabano remembers that as the selection process drew to a close, she kept her phone ringer turned up so she wouldn't miss a call from the selection committee. "When I found out, I was really happy. I told my parents -- we were all really, really, really excited. I can't wait," said Rabano.